Weddings have evolved. No longer a vehicle for sugared almond sales and varied only in pastel tones or train length, weddings are now truly a celebration of the couple themselves and personality is positively encouraged. Coombe Trenchard couldn’t be happier about this progression and welcome fresh ideas from every bridal couple we meet, all envisioning our interesting spaces in nuanced thought bubbles of wedding joy. You see, Coombe Trenchard’s history is embedded with more than its fair share of characters and individuality, not to mention the Arts & Crafts movement that applauded and sought one-off craftsmanship and stylised interest at every turn. Of course, we are also home to the country’s only disappearing wall, a true feat of design, engineering and radical genius. You can see the disappearing wall in action on this video, and be rest assured its unique magic permeates every part of the house. After much research and discussion with historians, we have concluded it was built purely because they could, a wanton use of talent and manpower that shouted extraordinary from the rooftops. And so, since 1906 when the house was built, those with a penchant for the unique have been drawn to Coombe Trenchard’s special kind of mysterious charm. We’re still hunting for the wine cellar, you’ll have to visit to discover what the Billiard Room walls are clad in (not something you would find in John Lewis!) and we continue to baffle visitors and historians alike whilst trying to piece together the story of this exquisite Edwardian home. This, of course, makes us a wedding venue with a difference, a grand home with a big heart that has a soft spot for things being done a bit differently; yet still achingly beautiful and timelessly stylish. Wedding suppliers, guests and visitors alike are filled with curiosity at the exquisite detailing and distinctive feel of the house and one of our 2016 weddings graced the cover of Mr & Mrs Unique magazine, something we feel wonderfully fitting for our deliciously different corner of Devon. Balanced with a hearty helping of vintage objects d’art and spectacularly atmospheric woodland, we can’t think of anywhere more wonder-filled that Coombe Trenchard for a day that is truly unique. Find our more by downloading our brochure here. As the last of the leaves floats down to earth and winter's chill permeates the air, we felt the urge to enjoy an injection of glorious green and relive our Spring themed shoot from earlier in the year. Making full use of the beautiful backdrop of the Coach House and with Icicle the peacock revelling in his debut, the wonderful Blue Fizz organised an array of stand out suppliers to descend on Coombe Trenchard, the results of which were then featured in Wed Magazine (issue 28). Bursts of vibrant, jubilant blooms were arranged by Vanessa at The Flower Mill Cornwall and the abundant foliage truly conveyed the sprightly, fresh energy of the season. Of course, daffodils had to show their smiley faces in this homage to botanical beauty and we adored their starring role in the statement headpiece, complete with twisted green twigs. With a nod to A Midsummer Night's Dream, hair and make up by The Event Studios was kept softly romantic with highlights of green and pink. Christine Trewinnard designed the elegant gowns worn and we delighted in both the silky ruffles and the muted moss tones. Bold, springtime colours were reflected within Knots & Kisses consistently gorgeous stationery and they looked perfect set outside for our gloriously green wedding breakfast on Coombe Trenchard's celebrated lawns. McKenzie Brown danced, laughed and snapped away and Samuel Daw & Co provided this sky blue blazer that popped against the rolling green hills seen from the Italian Terrace. 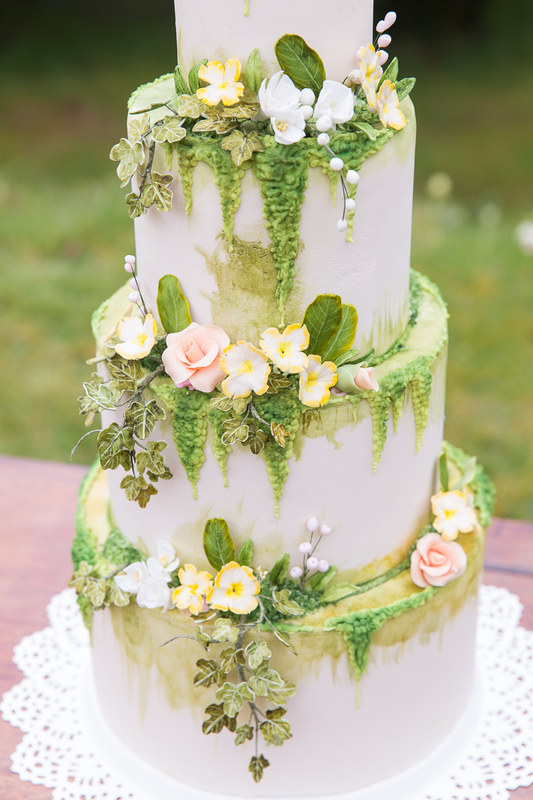 Sugar Mama's Cakery created a total showstopper of a cake to celebrate the botanical goodness, handcrafting intricate sugar flowers, leaves and vines that wowed every single person on the shoot! It was a pleasure to host such a lovely group of talented people at Coombe Trenchard and we can't wait to work on some more shoots in the coming months.